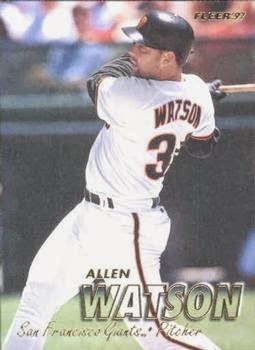 For Queens native Allen Watson, Tuesday’s Hall of Fame election should be a slam dunk for two of his former teammates, Barry Bonds and Mike Piazza. Watson starred locally at Christ the King High School in Middle Village and earned All-American honors at New York Tech, which led to a first-round selection by the St. Louis Cardinals in the 1991 MLB draft. He played for six different teams in his eight-year big league career, with two of those stops providing Watson the opportunity to watch Bonds (Giants, 1996) and Piazza (Mets, 1999) operate up close and personal. While Bonds didn’t tag Watson for one of his 762 home runs, Piazza hit an epic blast off of Watson in St. Louis in 1995 that looked like it was shot out of a cannon. Watson marveled not only at the speed at which Piazza's home run traveled, but the fact that shortstop Ozzie Smith almost had a chance to catch the ball. Despite both candidates’ resumes being clouded with allegations of steroid use, and Watson's own alleged steroid use in an affidavit by former teammate Jason Grimsley (which he vehemently denied), Watson said that none of the players from the steroid era should be excluded from the Hall of Fame because of the drug’s ubiquity during that time.